A new Green Infrastructure (GI) guide, launched by the United Nations on the occasion of World Water Week in Stockholm, Sweden, seeks to raise awareness about the benefits of using GI solutions for water resources management. The publication says that GI techniques can result in viable and cost-effective alternatives to grey-water infrastructure, as well as support environmental goals like adapting to climate change, according to a press release of the United Nations Environment Programme (UNEP), which has prepared the guide in collaboration with DHI Group, International Union for Conservation of Nature, The Nature Conservancy and the World Resources Institute. The UNEP-DHI partnership—Centre on Water and Environment—was established in 2001 as a centre of expertise. The partnership is supported by the Danish Ministry of Foreign Affairs and is dedicated to improving the management of freshwater resources from the local to the global level. The guide says that the responses to water challenges are not always a straightforward choice of green versus grey, and that certain water management challenges can benefit from a combination of green and grey infrastructure. 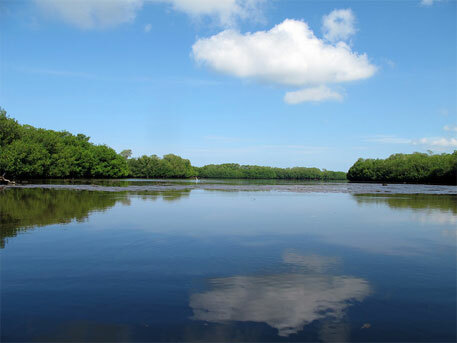 According to a report of allafrica.com, a news website, the capacity of GI to build resilience to climate change has proven to be effective in conserving mangroves that provide shoreline protection against coastal erosion and storms to restoring natural floodplains that recharge groundwater and reduce the risk of severe flooding. Examples of GI solutions include constructing and conserving wetlands, reconnecting rivers to floodplains and introducing flood bypasses. Floodplains, for example, can reduce the risk of flood while simultaneously improving water quality, recharging groundwater, supporting fish and wildlife and providing recreational and tourism benefits, the report says. Meanwhile, the eThekwini Municipality, a metropolitan municipality in South Africa, has received the coveted 2014 Stockholm Industry Water Award, reports SA news, a South African government news agency. The award was handed over to the outgoing eThekwini Water and Sanitation (EWS) head, Neil Macleod, at the World Water Week in Stockholm. “I think our biggest achievement as a water service provider has been bringing water and sanitation services to so many poor people and transforming their lives,” the agency quotes Macleod. EWS was set up in 1996. By 2000, it expanded its scope to provide water to one million people. Macleod admits that this feat has not been achieved by many countries. “The key to our success has been innovation and not being scared to take unconventional decisions. What we have realised is that into the future, we need to find new technologies that meet people’s expectations when it comes to sanitation,” he said while receiving the award. As the world debates ways to manage the planet’s water resources, a new analysis by the World Resources Institute (WRI), a Washington-based research group, shows that 38 per cent of the global shale resources in countries such as China, Mexico and South Africa face “high” to “extremely high” water stress or arid conditions. WRI released a report at the World Water Week in which it warns that water shortage could potentially limit the development of shale in every continent, except Antarctica. Nations at high risk include India, the US, Canada, Argentina and Pakistan, which falls in the worst or extremely high category. “Water risk is one of the most important but under-appreciated challenges when it comes to shale gas development,” Bloomberg quotes Andrew Steer, president and chief executive officer of WRI. “With 386 million people living on land above shale plays, governments and business face critical choices about how to manage their energy and water needs,” he adds. WRI claims that its report, “Global shale gas development: water availability and business risk”, is the first publicly available analysis of water availability across all potential commercial shale gas and tight oil resources worldwide. It says that in countries like the UK, the situation is more complicated. “The UK is Europe’s third-largest natural gas producer, but it is densely populated and 34 per cent of its shale resources face high water stress,” Bloomberg cites WRI. Steer says the analysis should serve as a wakeup call for countries seeking to develop shale gas. “Energy development and responsible water management must go hand-in-hand,” he adds. Lead author of the report, Paul Reig, says that the report can help to ensure enough water available for industries, farms and people even if shale development advances.